Mo Farah made a monumental move in January 2011. No, not a strategic in-race move to break away from the pack, but rather a career-defining resettlement from Great Britain to the United States. The then-27-year-old Farah committed to the Portland-based Nike Oregon Project (NOP) and its head coach, Alberto Salazar. In this group, Farah would train primarily with Galen Rupp, who has been under Salazar’s guidance since his high school days. Rupp was 24 years old at the time, and he would soon realize the importance and advantage of having Farah by his side for thousands of miles. Without delay, Farah dismantled the British and European records for the indoor 5,000 meters, running 13:10.60 on February 19 in Great Britain. This would be just the start of something extremely special. Since joining the NOP, Farah has become the distinct class of the 5K and 10,000 meters. The Olympic Games and IAAF World Championships serve as track and field’s premier stages. Athletes across all events establish training regimens and schedule races based on those two gargantuan meets. A professional runner’s ultimate goal? Take home an Olympic and/or Worlds medal to his or her home country. As basketball players’ careers are defined critically by championships (or rings), Olympic and Worlds medals have a strong say in ranking running’s all-time greats. Show up, deliver when it counts and get rewarded. Note: World Championships occur every two years; Olympics every four. What can you take from this? Other than claiming seven of a possible eight gold medals (his lone non-gold is a silver), Farah has appeared in every possible World Championships and Olympics since uniting with Salazar, an indication of long-term health. Also, Salazar has morphed Farah into a tactical-racing mastermind. 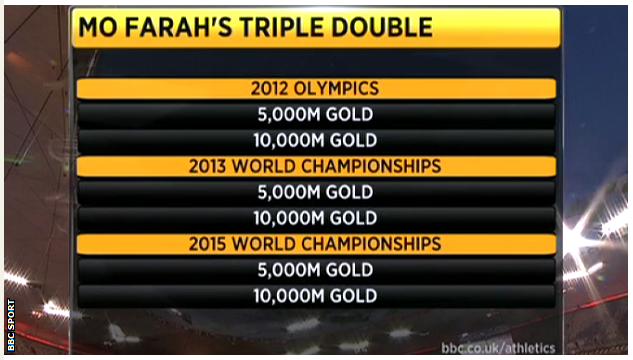 You’ll notice those above times aren’t eye-popping compared to world records and Farah’s personal bests (PB). This is because of championship-style racing, and it’s necessary to have the gear to kick home, and kick hard, in races like these. Farah’s final lap of his 2012 Olympics 10K victory? 53.48 seconds. One week after his 10K triumph, Farah came back and took 5K gold with a 52.94-second close. (Oh yeah, and four days after the 10K, he had his 5K prelim in order to clinch a spot in the 5K final.) Salazar was on point with his claim, which was made prior to the London Games. A 55-second last lap—a terrific final 400 meters, to say the least—would have you struggling for, and probably missing, the medal stand. If you need further proof of the need for a blistering kick in high-profile races, Farah closed his 2013 World Championships 5K win in 53.52. In his most recent World Championships 10K in Beijing, he closed in 54.15. His 2015 World Championships 5K gold was won with a 52.6-second last 400 (and a 1:48.6 final 800). It’s clear: Farah has been on a maniacal, jaw-dropping tear when it most counts. But have his PBs, like his closing kick and championship-racing strategics, drastically improved under Salazar, too? Clearly, he entered the NOP with far-from-mediocre performances; he just didn’t have any visits to global medal stands. Farah hadn’t seriously lifted weights before joining the Oregon Project a little more than two years ago. Improved physical strength has played its role in Farah’s success. Rupp has obviously benefited from the Britain’s presence, but it’s not a one-way street. Farah has also benefited from having the American 10K record holder by his side. Rupp actually has quicker PBs than Farah in the indoor 3K (7:30.16 in 2013); indoor 5K (13:01.26 in 2014); and 10K (26:44.36 in 2014). The duo’s brightest moment to date was at the 2012 London Olympics 10K: Farah stormed to gold, while Rupp followed right behind in second, claiming the first USA Olympic 10K medal since 1964. Yes, Rupp has a global medal, but Farah has eight—seven gold, one silver. I’m not taking anything away from what Rupp has accomplished or belittling his impact on the world of distance running; I’m just returning to the main focus of this piece. You’ll notice in that last bullet list that Farah now has three national records, four European records and one world record on the track. Please know this, too: Back in March of this year, he also broke the European record in the half-marathon, running 59:32 in Lisbon, Portugal. Returning to the track: Farah’s 1500-meter PB should not go unnoticed amid all his 5K and 10K accolades. He will be remembered most for his 5K and 10K glory (unless he goes nuts on the roads), but he sits at No. 9 on the all-time 1500 list with his 3:28.81 from Monaco in 2013. He has dipped under 3:30 twice in his career, the other time coming this year at Monaco when he ran 3:28.93 in a Diamond League contest. “I’m just stunned. You should never become too attached to records, whatever they are, but it’s been a long time now, and I wasn’t expecting it to go in that fashion with a distance runner. When Cram said “us” and “we,” he was referring to himself, Sebastian Coe and Steve Ovett—three former British mid-distance stalwarts who exploded in the 1980s. No one really expected Farah to take down Cram’s 3:29.67. Imagine running a 3:28.93 1500—Farah’s aforementioned time from Monaco this year—and being somewhat disappointed because you didn’t set a PB. That’s world-class metric-mile running, and Farah doesn’t even focus on the event. To put it in perspective, his NOP teammate, Matt Centrowitz, has a 3:30.40 1500 PB and caters his training toward the 3 ¾-lapper. The 25-year-old Centrowitz has two Worlds 1500 medals—a bronze from Daegu in 2011; a silver from Moscow in 2013. It’s far from asinine to claim Farah could easily be a 1500 medalist on the global stage—especially if the 1500 was his go-to event. He ran it in front of a home crowd at the Birmingham Indoor Grand Prix in England. He also ran the second and final mile in 3:59.5. Oh, and second place in that race was 8:13.46, meaning Farah ran it primarily on a solo effort. Farah has torn up the track, and it’s expected he commits to the 2016 Olympics in Rio de Janeiro to defend his Olympic 5K and 10K crowns. What will happen when Farah commits primarily to the roads? I mentioned his European record in the half-marathon. He also clocked a 2:08:21 marathon debut in London in 2014. That was a rare year with neither Olympics nor World Championships, allowing athletes to pursue fast times or dabble out of their comfort zones. The marathon debut was highly anticipated, but it didn’t go to plan. Yes, a 4:54 mile pace for 26.2 is a respectable first go-around, but Farah finished eighth in a race won by Kenya’s Wilson Kipsang in 2:04:29 (4:45 pace). Don’t worry; Farah will be back for more. Expect a road-racing onslaught in the near future for the now-32-year-old. And expect Salazar to have his athlete primed and ready to go. It’s remarkable what the Farah-Salazar tandem has accomplished since 2011. Not even a half-decade has elapsed since Farah made the smartest, boldest move of his life. National records, European records, a world record, gold medals—you name it. The man responsible for the Mobot reigns supreme. For Rio 2016, the following moment—in the 5K, 10K or both—is nearly a given: Mo Farah gritting his teeth in the final straight, glancing behind to keep tabs on those struggling in pursuit, all while displaying his arm swing with frantic precision and adding yet another gold to his already-vast legacy. For more HR write-ups, click here.